WTF: What’s With the Extra-Tall Utility Poles on the Burlington Waterfront? Burlington Mayor Miro Weinberger’s administration plans to bury a tangle of power lines that clutter views near the Moran Plant as part of an infrastructure upgrade and beautification project known as Waterfront Access North. Given this goal of aesthetic betterment, why is the city also replacing a nearby series of 45-foot-high utility poles with an even taller set of poles? To start with, the beautification project has built-in limits. Officials say the infrastructure makeover will be confined to the area between Waterfront Park and the southern boundary of the Urban Reserve. The power lines within that almost nine-acre site will be moved underground at an estimated cost of about $1 million. There’s no money available to continue the undergrounding of utility wires north of Moran, says Peter Owens, director of the city’s Community and Economic Development Office. But the question remains: Why is the Burlington Electric Department erecting 55-foot-high poles along the portion of the bike path adjacent to the waterfront’s dog park? Won’t those 10-feet-taller poles, and the lines that hang from them, clutter sight lines? Yes, they will. On balance, though, information from BED suggests the new poles may actually enhance the overall appearance of the stretch of waterfront running from Moran to the point where the bike path jogs slightly uphill en route to North Beach. Charlie Willette, head of BED’s operations unit, explains that the new poles will support two sets of transmission lines. 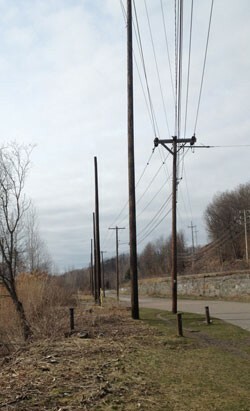 The shorter poles to be replaced along that section of the bike path carry only a single set of lines, he points out. BED plans to remove another nearby series of poles running just east of the railroad tracks and transfer the lines they support to the new poles, Willette says. The result: That stretch of bike path will be marred by fewer utility poles and electricity lines once the work is completed in a few weeks. But will passersby notice the difference? Maybe not as such, but many walkers, runners and cyclists could eventually have an airier impression of the route between Waterfront Park and the dog run. The utility undergrounding that’s part of the $8 million Waterfront Access North project is likely to be completed about a year from now, Owens says. He notes that the city must build its new $1 million skate park east of Moran before the power lines can be buried. Construction of the skate facility is scheduled to get under way in late summer or early fall, Owens adds. Anyone who pauses now to study the thick web of power lines near Moran will be struck by their heavily industrial look. It must have seemed appropriate in the days when the waterfront was a locus of shipping and power generation. But today, all those poles, wires and transformers are out of sync with what the city and voters want the waterfront to become: a place of leisure and low-impact recreation. The evolution from old waterfront to new waterfront can be traced in the park itself. Most of the poles and power lines that once clashed with the park’s aura of relaxation are gone now. BED buried them a couple of years ago. One tall set of electrical transmission lines does remain in place in the park, but Green Mountain Power, their owner, plans to put them underground in the next year, Willette says. The visual muddle caused by aboveground wires is also readily obvious in historical photos of downtown Burlington. As on the waterfront, the sky above the city’s core was once a jumble of telephone and electricity lines. A then-and-now comparison reveals the subsequent aesthetic improvement. Such a net gain in beauty comes at a high price in dollars. Utility industry sources suggest the cost of installing lines below ground can be 10 times greater than that of stringing them on poles. Undergrounding can save sizable sums of money in the long run, however. The storms that rip down lines above the street, resulting in power outages and high repair costs, have no effect on what lies beneath. The same segment of local opinion that favored preservation of the rusted Pease grain tower in Waterfront Park (finally razed 13 years ago) no doubt admires the “authenticity” of aboveground utility lines. The new, taller poles will thus appeal to certain tastes in a city of contrarians.